Time to sell your home in Lake Forest? Read about today's home buyers. Lake Forest is, by far, the largest subdivision in Daphne, AL. 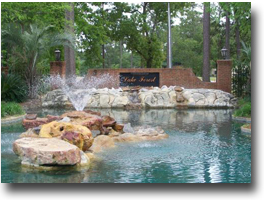 Lake Forest is probably the largest community in Baldwin County. The Lake Forest area has an 18 hole golf course and a community tennis center. Other amenities include a clubhouse and meeting room and don't forget the great location. Lake for homes are near I-10 making the drive to both Mobile, AL and Pensacola, FL quick and easy. Lake Forest is located near the intersection of hwy 90 and 98 and close to downtown Daphne. A short drive from Fairhope, which is consistently voted one of America's favorite place to live and also Gulf Shores and the beautiful beaches that parallel the Gulf of Mexico, Lake Forest is a secluded area and a great place for family. The school systems in the Baldwin County area are among the best in the state. If you would like to schedule private viewings, need information or have questions concerning Lake Forest property or any other real estate in the area, please email info@condoinvestment.com or call (251) Area-Pro for immediate assistance. Lake Forest is less than 5 minutes away from I-10 providing quick access to nearby cities, Pensacola, FL and Mobile, AL. It is an approximately an hour drive for Lake Forest residents to visit the Gulf's beaches. Use our site to research in-depth real estate information for Gulf Shores condos for sale and Orange Beach condos for sale as well as other properties along the Gulf Coast. Our sale info now includes recently SOLD real estate too, complete with actual SOLD prices and closed dates. Our site caters to investment-minded transactions, so we provide as much financial info as possible. Escambia County does not allow the publication of SOLD info, but we only need a request to provide these numbers. This is most noticeable for Perdido Key condos for sale.